When we last left Sherwin Shayegan — the Seattle man known as the Piggyback Bandit — he was on the road again. It seemed like only a matter of time before he popped up somewhere in the American heartland. But where? Sherwin had jumped on the backs of so many high school athletes, and in such far-flung locales, that he was banned in five states. in Missouri. He was 1,500 miles from home. The Landmark newspaper’s Valerie Verkamp reports that Sherwin was spotted in Platte County, which touches the Kansas City suburbs. 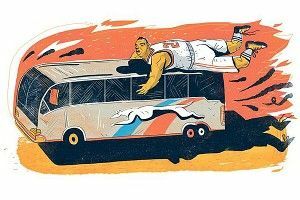 If Sherwin came from Seattle by bus — his preferred mode of transportation — the trip would have taken nearly two days. Sherwin told a worker at the Sheraton about his five-state ban. But he did not, to Verkamp’s knowledge, do any piggybacking. “In fact, folks in town described him as cordial and pleasant,” she writes. Sherwin did leave a clue about his next sporting event. He told the people he met that he looked forward to seeing a Chiefs game.